There are times when a bird will begin to pluck or chew his features. If you notice your parrot behaving in this way, pay attention but don’t let her know you are paying attention. If it’s behavioral you don’t want to encourage it by giving the more attention. Typically, some type of problem needs to be addressed before the behavior will stop. Often with plucking there is some type of precipitating incident but this can also be health-related. Over time, plucking becomes a very difficult habit to break, although not impossible. If your bird is plucking his feathers, you first need to identify the underlying cause, which can be challenging. Most importantly, the bird should be checked by a reputable veterinarian. This will help rule out any type of infection, skin condition, or some other medical problem. 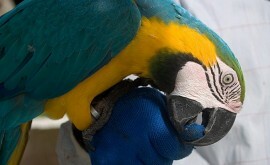 A veterinarian will also check the area of the body where feathers are being plucked. For instance, if plucking occurs around the chest area, it could indicate a respiratory infection. Fungus and mold in the bird’s area can cause infections that irritate skin or lungs. Aspergillus in the parrot can cause plucking and other types of self-injury, but can be treated effectively with anti-fungal medications. Additionally, the bird’s cage should be moved to a drier area or the source of the excess moisture removed. See my article on Aspergillus and what foods it can come from so you know what foods to avoid. If the bird is healthy, there could be an environmental reason for the plucking and chewing. For this, you want to make sure the bird is in a room or area of the home that is not overly dry or humid and one without direct heat or cold. Experts also recommend giving your bird a bath, which can be done by taking him into the shower or allowing him to walk around in about two inches of water in the tub, both supervised of course. The bird might also be feeling scared or stressed. A recent move or some other perceived bad experience could be the culprit. For instance, any newly hung artwork, a new dog or cat in the home, balloons, a computer monitor placed in the bird’s room, and other things like that can cause fear and stress that leads to plucking. 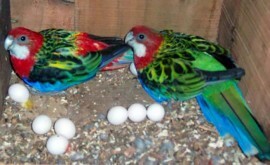 Even losing a cage friend or mate can cause a bird to pluck or chew. Watch cage mates also sometimes one bird of the two is plucked while the other is completely feathered can be from over preening. Something else to consider is nutrition. 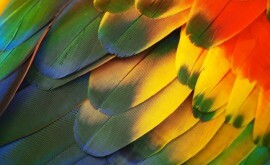 If a parrot is not being properly nourished, plucking could result. In addition to pellets and seeds sold in packages specially formulated for specific types of parrots, your bird needs fresh fruits and vegetables. If your bird just started to pluck, you might want to consider vitamins that can be added to the water or that species specific needs. Some parrots need extra protein or fat and depriving them of this may be the culprit. Do your research and know your species nutritional needs as they are not all the same. Boredom is another reason for plucking. While in the cage, your bird needs a variety of toys and playthings to include ropes, bells, shredder things, foraging toys to hide their food, hard and soft wooden blocks, and so on. This is most often times the cause of a companion parrot to start plucking. Imagine a 3-4 year child with nothing to do what kind of trouble do you think she’d find herself in? 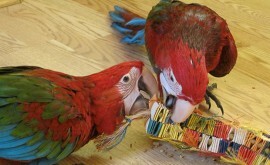 While outside the cage, you want to spend quality time playing with your bird as well. A change in routine might also cause plucking. Birds are creatures of nature, meaning they like routines so if something changes, it could lead to this unwanted behavior. To the best of your ability, get the bird back on the old routine and then slowly make changes that will create stress. After trying everything but without success, you might want to consider working with a licensed bird behaviorist. Remember, using the information provided, plucking is usually stopped but it takes time so you want to be patient through the process and don’t let it stress you because your companion parrot will sense it.